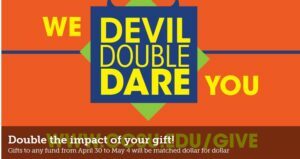 Please support the Burritt Library in Devil Double Dare Campaign 2018! To Friends of the Elihu Burritt Library! Next week, April 30 – May 4, the CCSU Alumni Association will match dollar for dollar on all gifts from $25 – $500. This is the time to make a gift and double the impact! On behalf of all our students, faculty and staff – thank you!